Every trip has a zero day. That's the day needed to get to the real start of your adventure. I stayed the night of July 23rd at Bruce’s house because we were to be up before dawn on the 24th, 4:30 AM to be exact, so that we could drive to Scott’s house and arrive by 5:45. 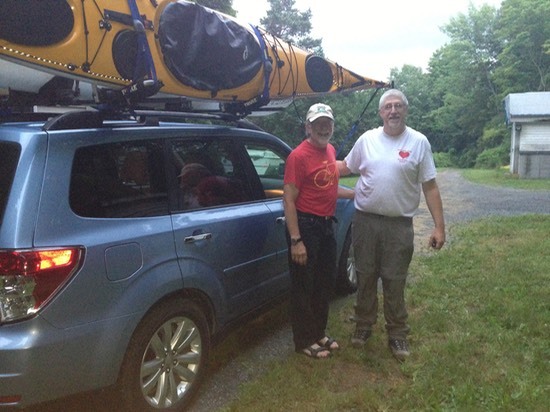 We arrived on time, transferred our boats to Scott’s new Subaru Forrester and loaded our gear inside. We were on the road by 6:15. It was warm enough when we started out on what would be a long thirteen hour trip. Because of our early start, we wound up eating breakfast, lunch and dinner on the road. That and stops for gas added hours to our drive. Then there was or chance meeting with Robin and Kaare at our dinner stop. Their “check engine” light had been on for most of the trip. Robin spotted a Toyota dealer across the road from the restaurant, so off we went to have the defect checked out. An hour later the dealer gave the OK to ignore the check engine light till they got home. We could go on our way. 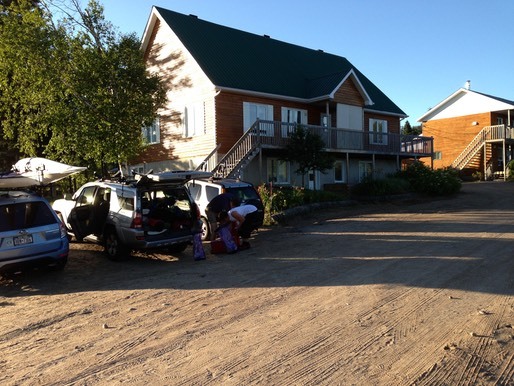 Kaare had arranged for a guide at the Five Star Farm Resort to haul us, our boats and gear to our launch point at Cap Jaseur, some 70 miles or so west of us in the morning. He had also arranged for an overnight in a large, warm, well appointed cabin. The warm part was especially important as it was cold with a chill wind blowing right through my Florida bones when we arrived. We sorted gear and test loaded our boats before repacking for the morning ride to Cap Jaseur. Then it was off to sleep, as most of us had been up very early.